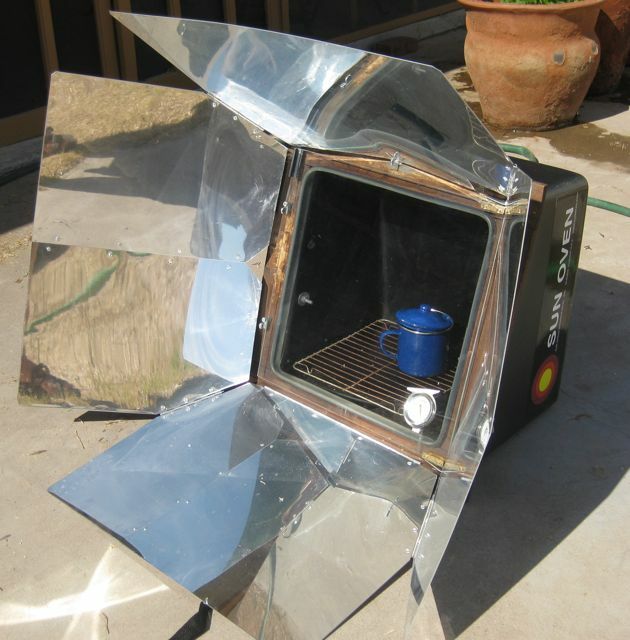 The Solar Oven Chef Has Moved! 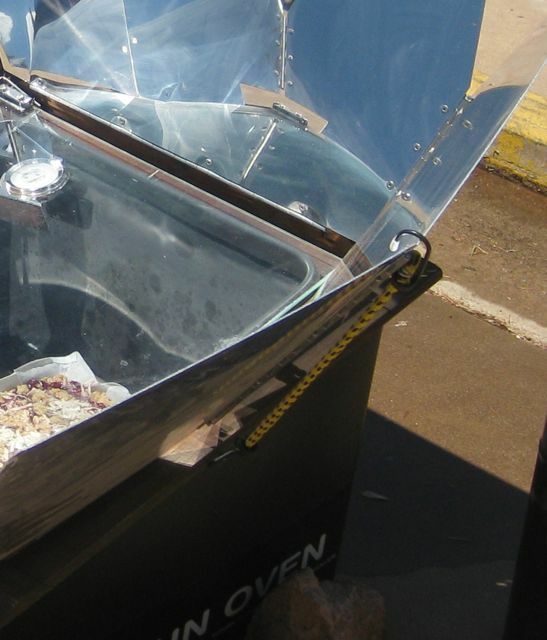 Paul Munsen, of Sun Ovens International, has asked me to continue blogging. The new blog is at their site. Follow the link below and check it out. 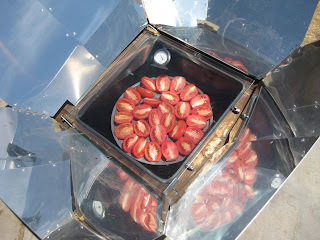 After a break from blogging about solar cooking, I set the sunoven out today to cook some brown lentils for Meatless Monday. With record 100º+ temperatures for the last month, and the sun shining brightly, no need to check the weather forecast right? Wrong! Thirty minutes after the lentils were started, dark clouds moved in, blocking the sun. The sun oven had to come in and the lentils finished on the stove. After another thirty minutes rain was coming down heavily! Combined with some really strong wind, it was enough to knock the power out in some parts of the city. 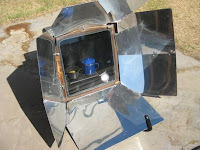 It is always good to get some rain, but I really hope the sun will be shining on the 6th, when I will be solar cooking on Weds as part of earth lunch hour; an idea to cook healthy and earth friendly lunches around the world in a 24 hour period, starting in Japan. Sounds like fun and I am happy to participate. As long as everything goes right, lunch will be solar cooking from 12 noon to 1pm Arizona time. I might even check the weather forecast beforehand. The croissant are in the Sun Oven, along with a cup of oatmeal. My bags are packed. The coffee is brewing. 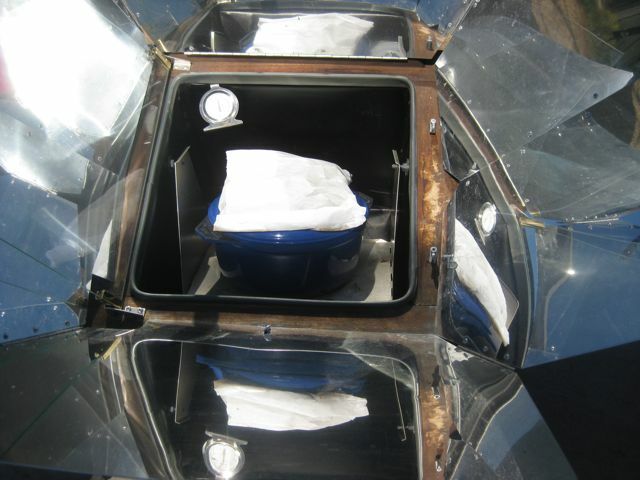 It's a few days early but this is my last day of my solar cooking year. I'm leaving for France, hence the croissant, this morning. I'll be back in a couple of weeks. I do plan on continuing with my blog, only with less frequent updates. Thanks for reading! I knew I was forgetting something when I went to bed last night. 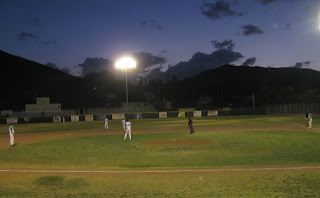 As soon as I turned off the light it hit me, my blog! 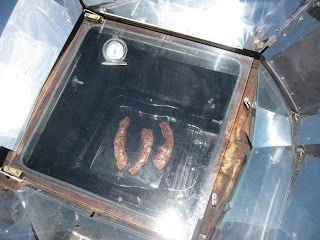 Oh well, at least I didn't forget to cook something in my Sun Oven or worse, forget to eat it. It was another batch of BBQ turkey thighs. Some for dinner and some to freeze. 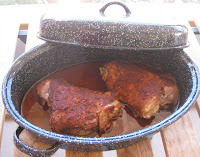 This time I brined the meat for about an hour in a solution of two tablespoons kosher salt, one tablespoon sugar, 1/4 cup liquid smoke, and two cups water. It cooked about two hours in the Sun Oven and was fall off the bone tender. Today it was another batch of blueberry muffins. They went straight from the Sun Oven to the freezer (after cooling of course) and hopefully Martin will enjoy them while I'm away. I'm a little doubtful that he'll actually heat up any of the other things I've prepared, but the muffins just need to be taken out of the freezer. Left at room temperature they'll be ready to eat in under 30 minutes, less if they are placed outside in the 100º + Arizona heat. Split pea soup, I've probably made this in the Sun Oven more times over the past year than anything else. It freezes well and is one of Martin's favorites. Hopefully he'll heat some up while I'm away. If not it will still be good when I get back. My freezer is going to be so well stocked. If Martin doesn't eat the stuff I'm preparing for him while I'm away we'll eat it when I get back. July will be a month of solar defrosting. 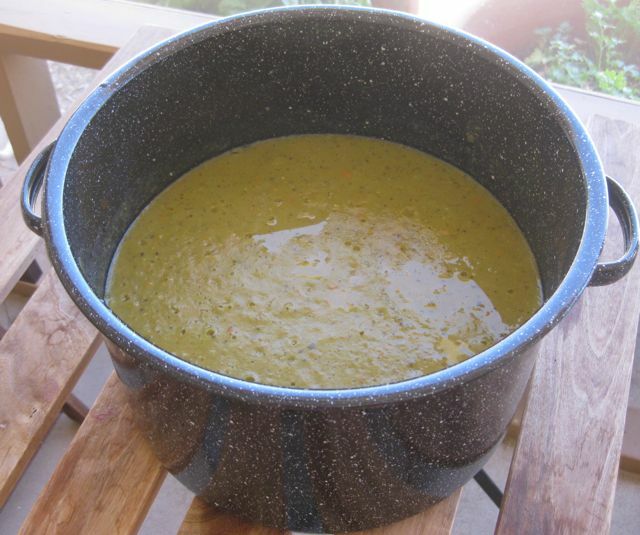 It only takes about an hour to make split pea soup in the Sun Oven. That left me plenty of time to cut up and roast a rutabaga and some butternut squash to go with it. I like the way the green and orange complement each other for a pleasing vegetarian meal. I don't plan weekly menus. I admire those who are able to do so, but have never had much success with them. The few times I've tried I'd spend hours putting together a detailed shopping list and head out to the store, only to find that some key ingredient was out of stock. I'd find myself in a panic, trying to improvise substitutions. It took all the fun out of grocery shopping. I gave up after a couple of attempts and have learned to accept the fact that winging it works better for me. 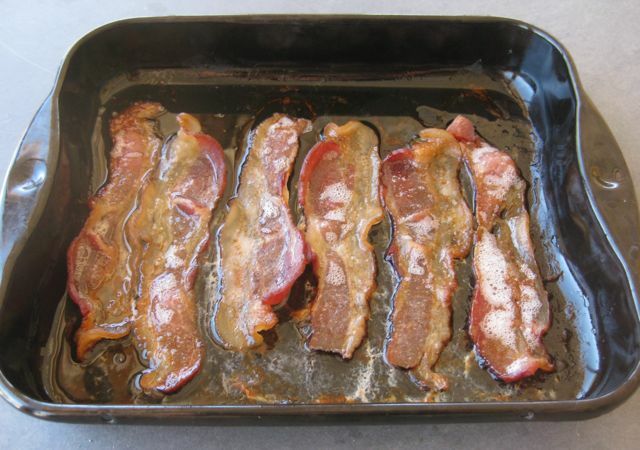 I do have one trick that helps me avoid wasting food. When I spot something new I'd like to try I don't buy it until I've found a recipe. 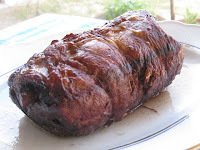 When I saw this boneless lamb shoulder roast at my local Fresh and Easy the other day I resisted the temptation to throw it in my cart until I could do some research. I found a recipe on epicurious.com that was easily adapted for the Sun Oven. The recipe was for a 4 pound piece of meat, that was slow cooked, at 300ºF for 5 hours; the ideal temperature for cooking in the Sun Oven. My cut was much smaller, under a pound, and it was ready in two hours. The meat was seasoned with a paste made of chopped pancetta, rosemary, and garlic. The meat was not browned before putting in the roasting pan, but you wouldn't know when you saw it on the serving platter. I think the pancetta was superfluous. I'd make it with only rosemary and garlic next time. 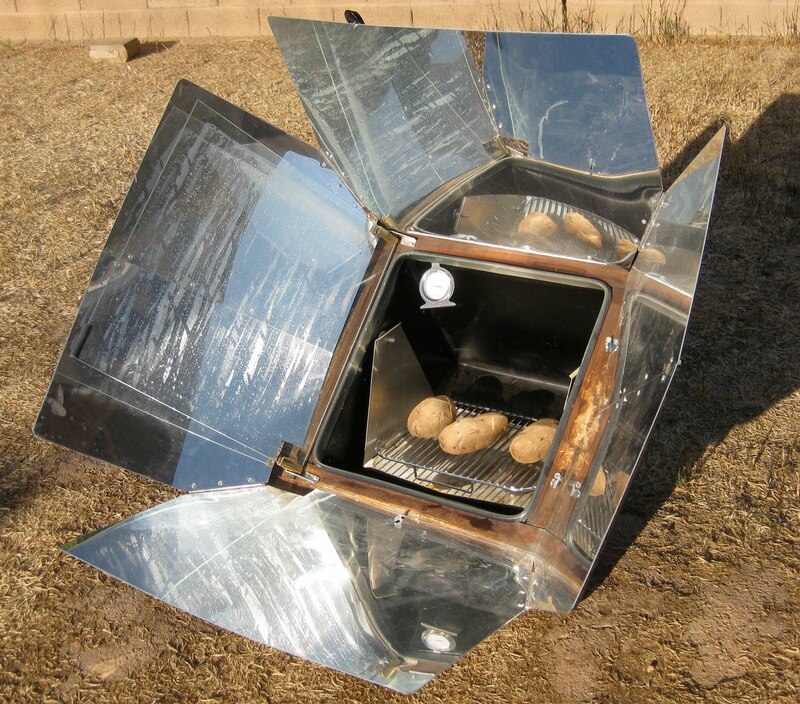 There was enough room in the Sun Oven to bake some potatoes to go with it. It was really good and I'll definitely make it again. 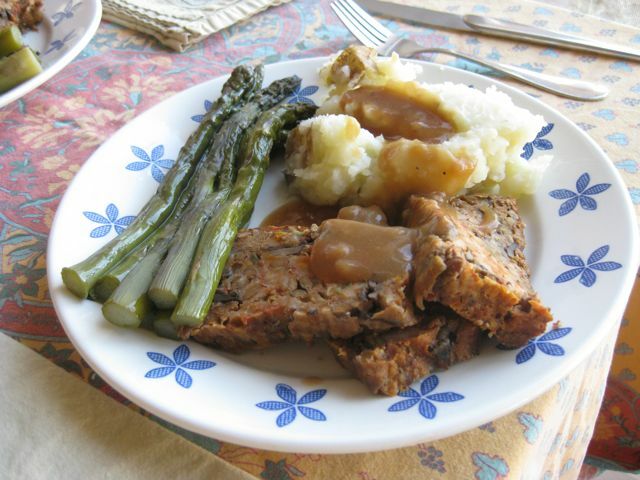 If you would like to read the recipe click here. I finished up the tomatoes this morning. It only took about an hour for them to dry out completely, so I guess if I'd gotten them started a little earlier yesterday there probably would have been enough time to finish them in on day. With the Sun Oven freed up I was able to toast some coconut for the cookies I'll be baking at the cook off on Saturday in Bisbee, and make a pot of Pasta Fagioli with the broth from the lamb shanks I made the other day. It was quite a hectic day, getting foster kittens squared away and making all the preparations for the cook off, but at least I didn't have to worry about burning dinner. 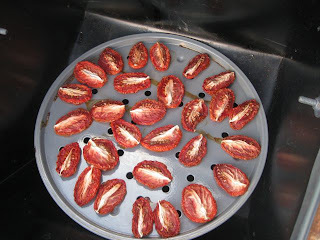 I used the last sun dried tomato from my previous batch the other day so when I saw roma tomatoes on sale I snatched some up. They would dry faster if I cut them up in smaller pieces, but I like the texture better when they're halved, even if it means it will take two days complete the process. About the only thing I use them for is my "No Mayonnaise Tuna Spread", but I make a batch almost every week so I like to have them on hand at all times. Soak the tomatoes in a small bowl of warm water for approximately 10 minutes. 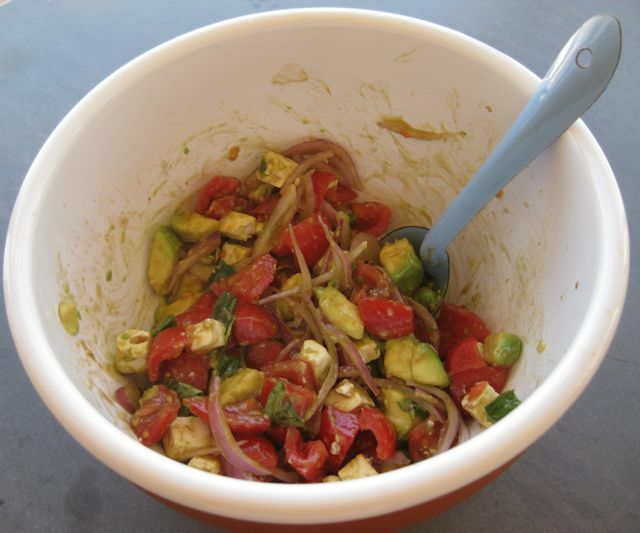 Drain tomatoes, reserving soaking water, and place in a food processor with the capers and olives. Process until finely chopped. Add tuna, olive oil, and herbs if using, and process until mixed. Add reserved tomato soaking water 1 tsp at a time while processor is running until desired consistency is reached. Depending on the type of tuna, it may not be necessary to add any water at all. 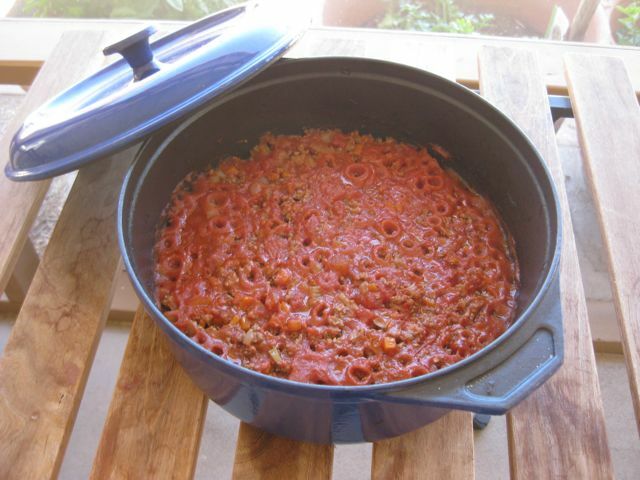 This spread can be used to make sandwiches or as a pasta sauce. 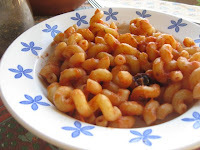 To serve over pasta retain a bit of the cooking water to add in as necessary. It will keep, refrigerated, for three days. This is another recipe from Marcella Hazan's "Essentials of Classic Italian Cooking". I don't know why I felt compelled to follow it exactly instead of cutting down on the butter and oil as I normally would. Don't get me wrong, it was delicious, but it's only Monday and now I don't have many flex points left for the rest of the week. 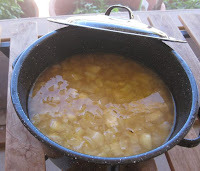 The sauce would normally simmer stove top, covered, at a very low heat for about an hour, then continue cooking uncovered, at a higher heat until the onions are brown and most of the liquid has evaporated. To make it in the Sun Oven I once again focused it in indirect sunlight to keep the temperature around 200ºF until the onions were soft. At this point I uncovered the pot, focused the Sun Oven directly towards the sun, and propped the glass door open to allow the steam to escape. 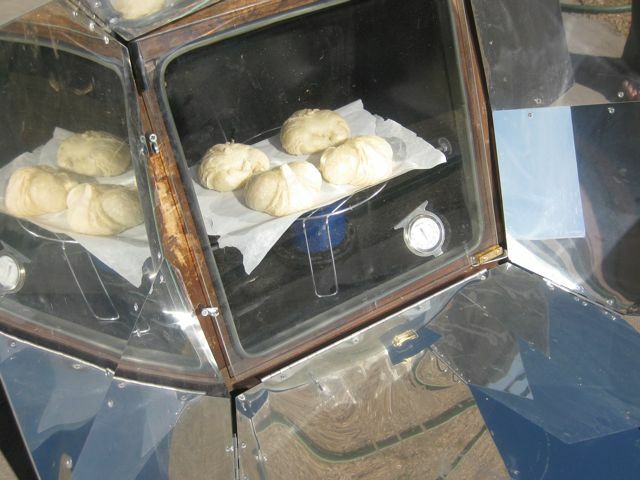 Even with the door open a crack the Sun Oven properly focused reached 350º. It was really hot today, 110º, so that might have played a part. Here's the recipe, using Marcella's quantities. Next time I'm going to use less fat and less pasta. Put butter, oil, onions, and some salt in a heavy dark pot. Place covered pot in Sun Oven, focused to keep the temperature at 200º, until the onions are soft, about one hour. Uncover pot. Focus Sun Oven directly towards sun. Prop open door to allow moisture to escape, and continue cooking until the onions turn a deep, dark gold color. Add the wine, salt and pepper to taste, stir and continue cooking until the wine evaporates. Remove from Sun Oven stir in parsley. Here's what we had for dinner. The butternut squash was also made in the Sun Oven. 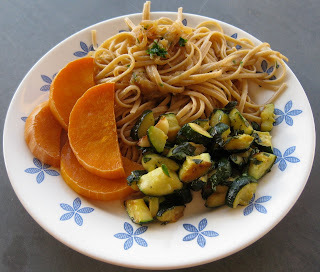 The zucchini could have been solar cooked but was a last minute thing that I made while the pasta was cooking. Not to sound like a broken record or anything, but I chose to make pulled turkey rather then pulled pork because it meant fewer calories. I've been extra diligent the last few weeks for a reason. I'm going on a ten day vacation at the end of the month and I want to lose some weight beforehand. Not to look good in a bathing suit, in fact I won't even be bringing one, but because I know I'll gain at least five pounds while I'm away. I don't condone yo-yo dieting, but I have found that it's much easier to drop a few pounds before a vacation than after. Like Sun Oven pulled pork, BBQ turkey is crazy easy. 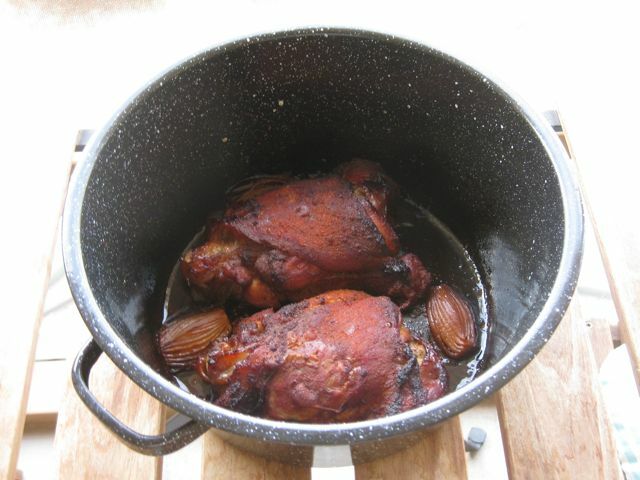 Just take a couple of turkey thighs, remove the skin, coat them with your favorite dry rub, pour some liquid smoke over them, throw in a quartered onion, and put them in the Sun Oven. When they're ready pull the meat off the bones and serve with your favorite BBQ sauce. I was in the mood for baking, just not for having anything too tempting around to pig out on. 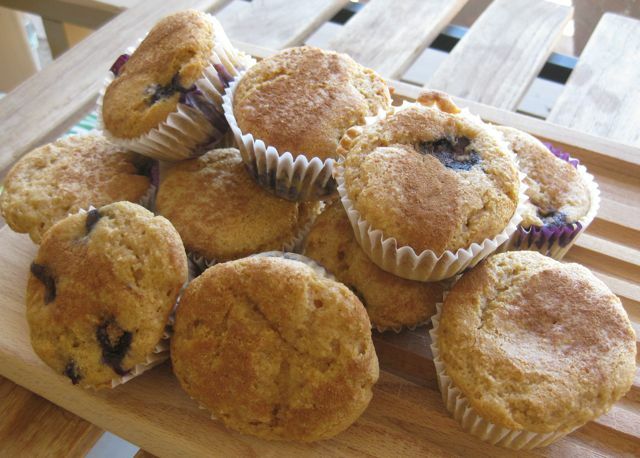 The good thing about muffins is after enjoying a few, they can be wrapped up, frozen, and put out of sight. 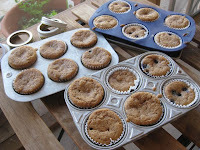 They're the same kind of muffins I made a few days ago, using Kodiak Cakes Flapjack Mix. I meant to add some cinnamon this time, but forgot, so I sprinkled a little on top before popping them in the Sun Oven. It was a nice touch. I really like having muffins in the freezer. It's so easy to grab one on your way out the door, put it on the dashboard to defrost, and in no time you'll have a nice treat to enjoy on the road. 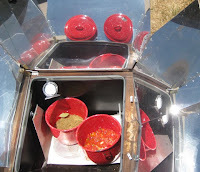 It was a pretty uneventful solar cooking day. Chicken with Two Lemons was on the menu, except I only had one lemon. It's been non stop sun for the past few days so I waited until after lunch to get started. Everything was going along just fine when I went out to run some errands. 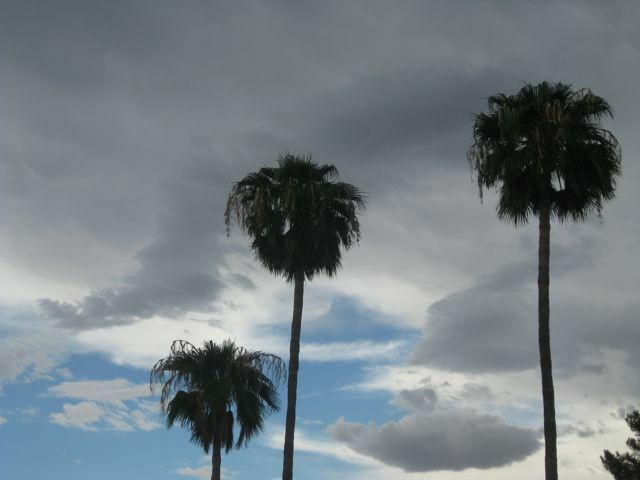 I don't know where they came from, but by the time I got home it was getting pretty cloudy. 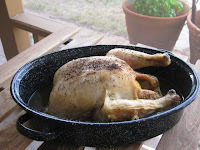 Luckily the Sun Oven was still hot and the chicken was ready. It was also close enough to dinnertime to go ahead and eat. 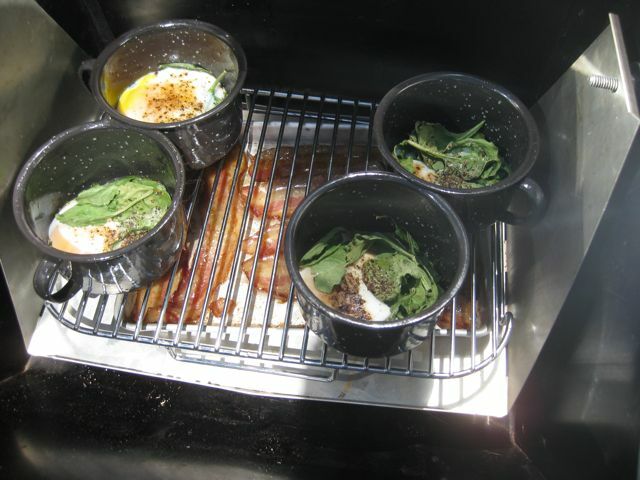 I'll quite often start a dish inside, sauteing vegetables or browning meat, before putting it in the Sun Oven. Today I did the opposite. The beans were solar cooked first, then the patties were deep fried. 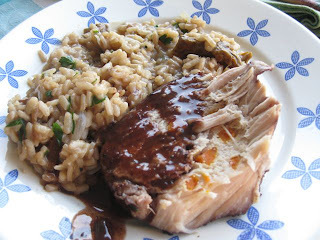 The recipe is one from a collection of recipes that I cut out of Italian magazines over twenty years ago. I don't use them very often, but always get a kick out of how they are written. Unlike American recipes with their precise measurements and detailed instructions, Italian recipes are more like the instructions you'd get from Grandma if you called her and asked how to make a family favorite. 500 gm dried beans, 1 onion, 1 celery stalk, 1 whole clove, 3 eggs, bread crumbs, 3 tablespoons grated parmesan, oil for frying. Soak beans overnight, then simmer them with the onion, celery, clove, and the salt. (salt was not mentioned in the ingredients) Drain and mash, add 3 egg yolks (oh, the eggs need to be separated? ), the cheese, and enough bread crumbs to obtain a good consistency (whatever that means). Mix well. 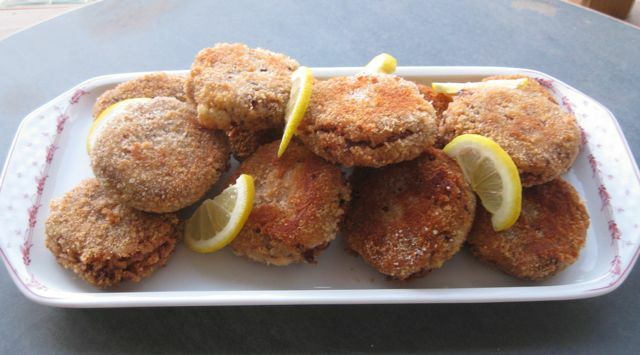 Make patties that you will dip in the beaten egg whites and then coat with bread crumbs and fry in hot oil. Serve immediately. So what did I do? I used cranberry beans. That's usually what "beans" means in an Italian recipe. Then I messed up by converting 500 gm (1/2 kilo) to 1/2 pound. I didn't catch my mistake until after I'd mixed in the three egg yolks, of course. I quartered the onion and the celery stalk and removed them, and the clove, before mashing the beans. Probably due to the fact that I only used half the amount of beans the recipe called for and all three of the eggs my mixture was a bit moist. I wound up adding 1/4 cup of bread crumbs. I assume you'd need less than that with the correct bean to egg ratio. The instructions don't say how many, or what size patties. 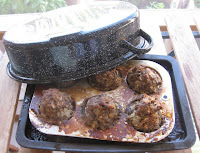 I got twelve good sized ones, probably about 1/4 - 1/3 cup mixture per patty. I really think the full recipe would serve at least eight people. Finally, in the picture in the magazine, and mine, you can clearly see lemon wedges. Granted, Italians always squeeze fresh lemon on deep fried foods, but it's an important enough touch to merit at least a mention. 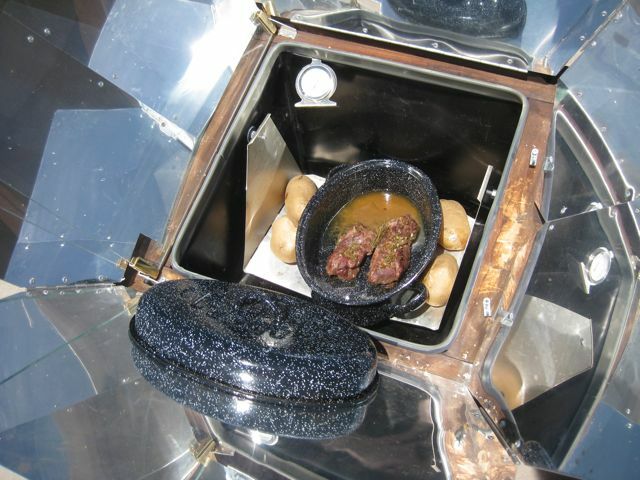 Solar Baked Potatoes to the Rescue! 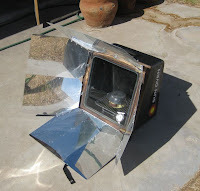 For a brief moment I thought I was going to get a day off from solar cooking; a Facebook friend's status update this morning said something about clouds - and yes, I checked Facebook before looking out the window - but turns out he was in Seattle for the weekend, so no such luck. 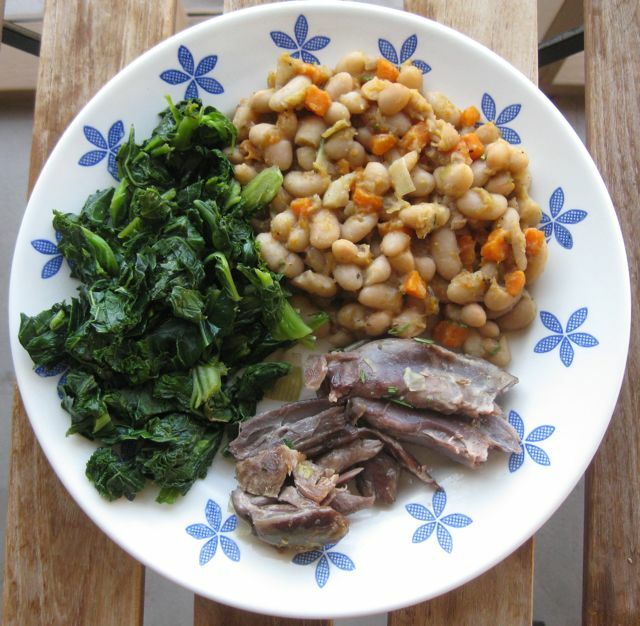 Uncharacteristically for me, I had no idea what I wanted for dinner and found no inspiration among the contents of my fridge and pantry. I spent most of the morning lying on the couch consulting cookbooks, but the spark just wasn't there. When 1 o'clock rolled in it was time to resort to the Solar Oven Chef's solar cooking project of last resort - baked potatoes, the one thing you can always build a meal around later. Puttanesca is a classic Italian pasta sauce. It's easy to make and very tasty. Today's batch was entirely cooked in the Sun Oven, including sauteing the garlic. The ingredients are olive oil, minced garlic, anchovy paste, strained tomatoes, olives, capers, and crushed red pepper. So many people are turned off by anchovies and capers, but in this sauce the anchovy paste is dissolved in the oil and the capers are minced, if you don't tell anyone they won't know they're there. 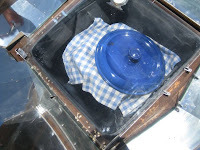 Put oil, garlic and anchovy paste in a a dark enameled pot and place in Sun Oven. Sauté until garlic is fragrant. 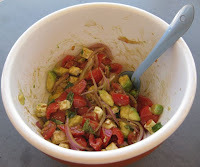 And strained tomatoes, olives, capers, crushed red pepper. Cover and simmer in Sun Oven for approx. 40 minutes. Serve over pasta with freshly grated Pecorino Romano cheese. Not new recipe, not even any new twist to it. I made it a couple of weeks ago and liked it enough to make it again today. 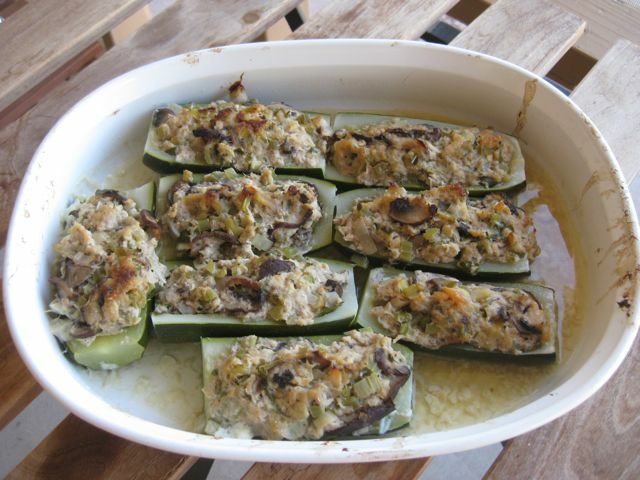 Don't let the picture fool you, one can of salmon goes a long way, I actually had to use two baking dishes and stack them in the Sun Oven, only half the zucchini are pictured here, it's enough for six to eight servings. Looks like we'll be having the leftovers for lunch tomorrow. 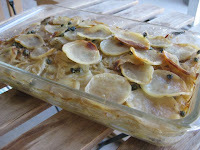 I made this potato dish once before during the first weeks of my blog. I remember liking it, but for some reason haven't made it again until now. It's a good alternative to the traditional, heavy on cream and cheese, potato gratin; and it gives me an excuse to use my mandolin slicer. 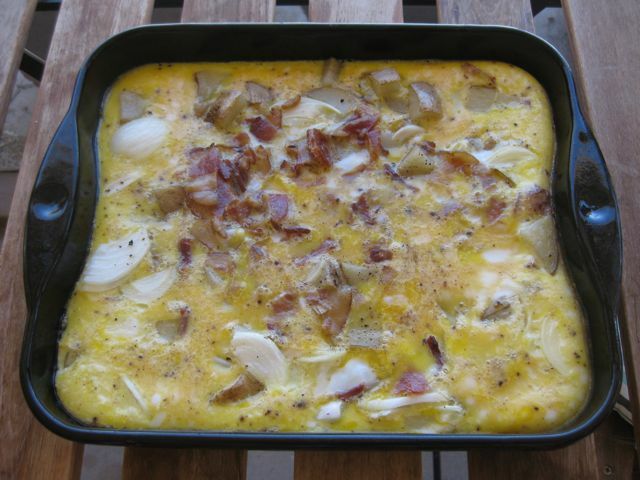 The onions do need to be browned on the stove before assembling the gratin, but that can easily be done while you're slicing the potatoes. 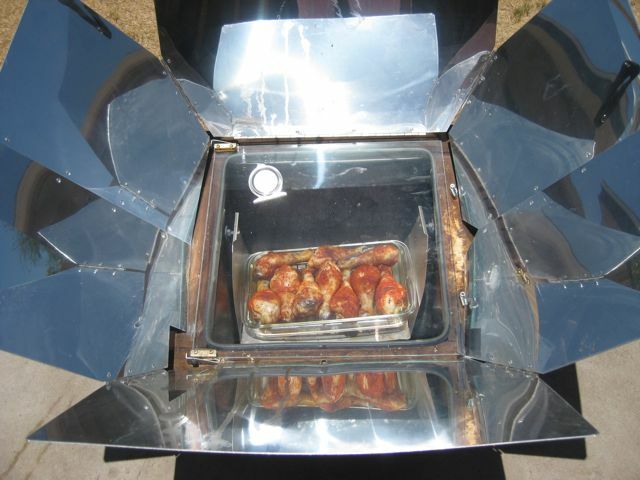 Set Sun Oven up to preheat. 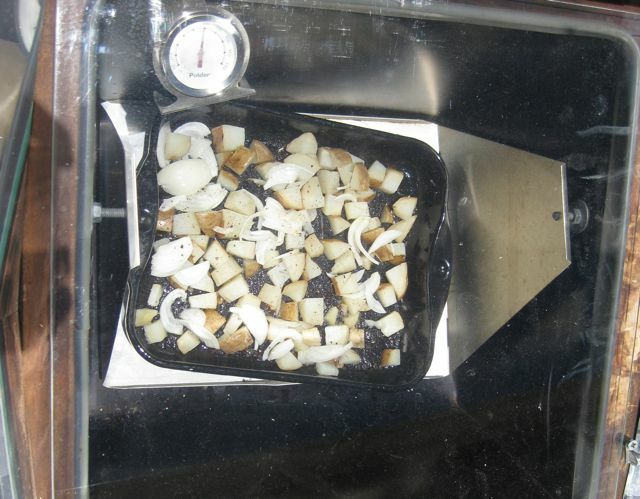 Rub 11x7 - inch glass baking dish with cut side of garlic clove. Brush dish with olive oil. Heat 1 Tbs oil in heavy large skillet over medium heat. 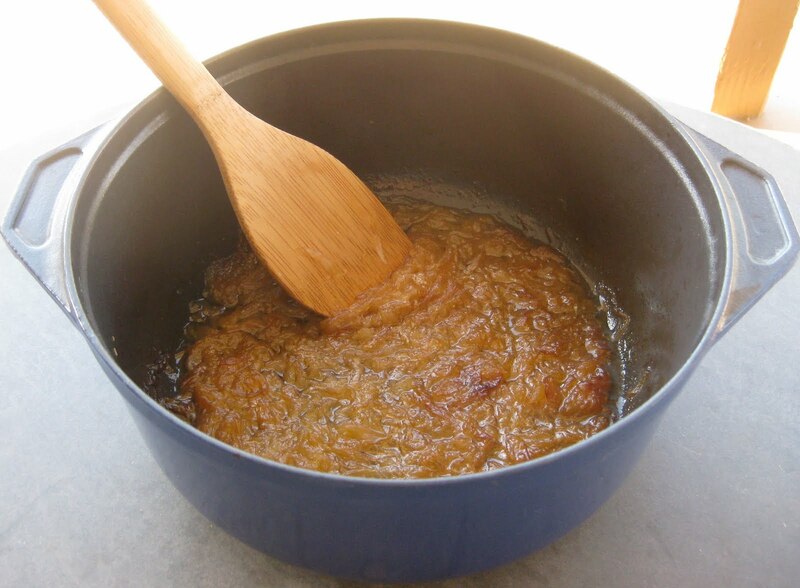 Add onions, sprinkle with salt, and sauté until soft and beginning to brown, stirring often, about 10 minutes. 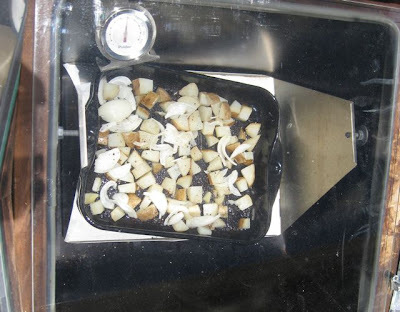 Arrange 1/4 of the potatoes in even layer in prepared dish. Sprinkle with salt and pepper. Scatter 1/3 of the onions over. Sprinkle with 1 Tbs Pecorino Romano and 1/4 of the capers. Repeat for two more layers drizzling 1/2 Tbs olive oil on third layer. Arrange remaining potato slices over. Sprinkle with salt and pepper and remaining capers. Drizzle with remaining 1/2 Tbs olive oil. Pour chicken broth over. Press down on potatoes to compact gratin. Cover gratin tightly with foil, cover with a dark tea cloth, place in Sun Oven, and bake until potatoes are tender, 1 1/2 - 2 hours. Uncover and sprinkle with remaining 3 Tbs Pecorino Romano. Bake gratin uncovered until cheese is lightly browned, about 15 minutes. Let gratin stand 10 minutes at room temperature before serving. 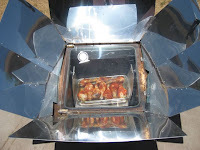 This is a simply, yet satisfying chicken dish that is perfect for solar cooking. The green beans were cooked along with it, in a parchment packet that I put on top of the dutch oven towards the end of the cooking time. 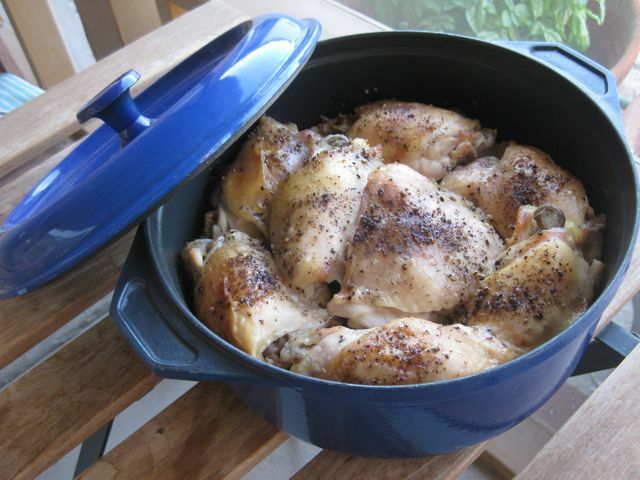 Combine oil, onion and turmeric in a large dutch oven. Add chicken, turning to coat. Add water, salt, pepper, lemon juice, and garlic. Place in Sun Oven for approx. 2 hours or until chicken is tender. Mix in chickpeas and leave in Sun Oven until heated. 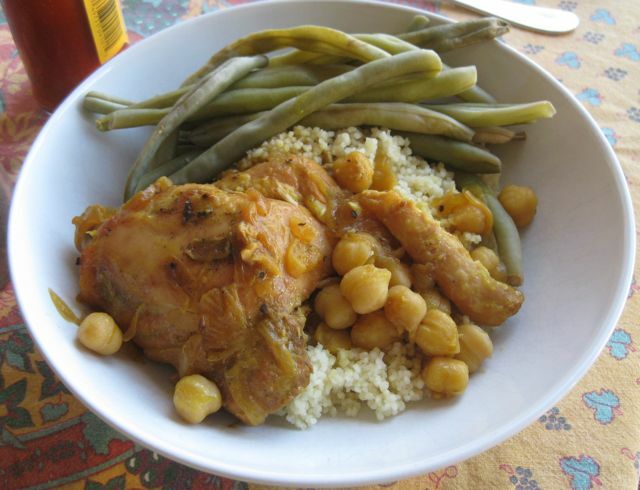 Serve over couscous with hot sauce. Tuesdays are my busiest day. I have to get up earlier than usual and am away from home all day. 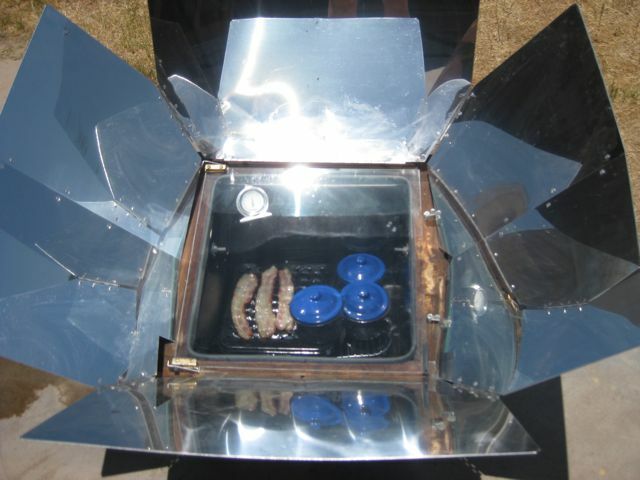 If I want to come home to a solar cooked meal I have to do most of the prep work the night before. Last night I didn't do any. That left me with little choice other than throwing a couple of beets in the Sun Oven to roast. At least I'd have tonight's side dish taken care of. I'll eat beets on occasion. There's a local restaurant we often go to - Joe's Farm Grill - where you can substitute beet salad for fries, and since I'm looking to cut calories wherever possible that's what I do, but I've never said to myself, "I could really go for some beets right now". 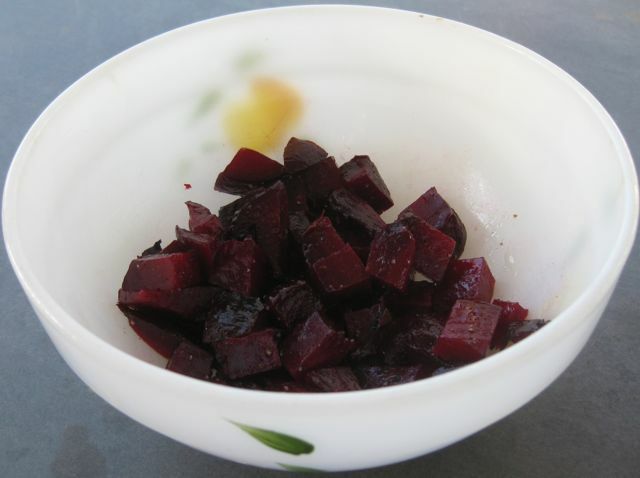 Before leaving this morning I scrubbed two beets, tossed them in a dark covered pot, and set it in the Sun Oven. In the past, out of habit, I would wrap them in tin foil first, but today I discovered that they come out even better without it. When I got home I took them out of the Sun Oven and when they were cool enough to handle I peeled them, chopped them up, and drizzled a little olive oil over them. They were so tasty I just may find myself craving more some day. I'm not a huge fan of lentil loaf but I was feeling frugal today and had just enough lentils left over from Saturday to make one. 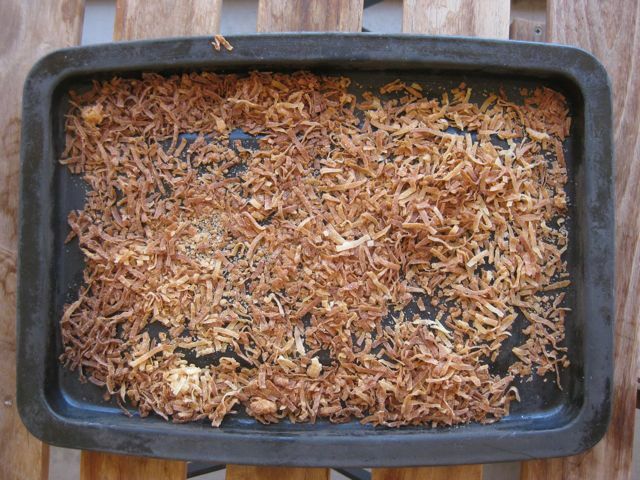 After smashing them up a bit, I mixed in some bread crumbs, an egg, grated parmesan cheese, and garlic powder. 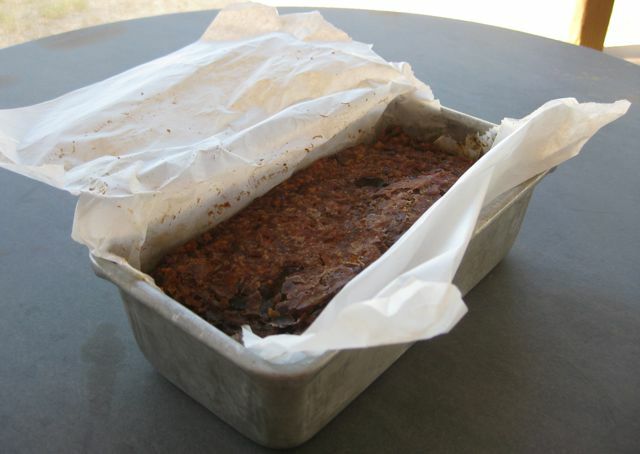 The parchment paper lining made it easy to get out of the pan and served as a lid during baking. It actually came out a lot better than I expected. I served it with solar baked asparagus and non solar mashed potatoes. The vegetarian gravy was from a packet. This is my other solar egg dish. 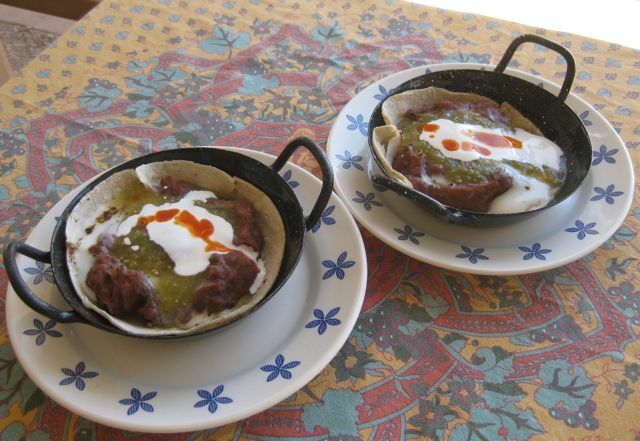 Coat a small pan with cooking spray, put one corn tortilla in each pan, spoon about half a cup of refried beans on each one making a well in the middle, crack an egg into the well and bake in the Sun Oven for twenty minutes. If you like cheese on your huevos rancheros sprinkle some on about two minutes before taking them out of the oven. After taking the huevos out of the Sun Oven season with salsa verde, sour cream, and a drop of hot sauce. 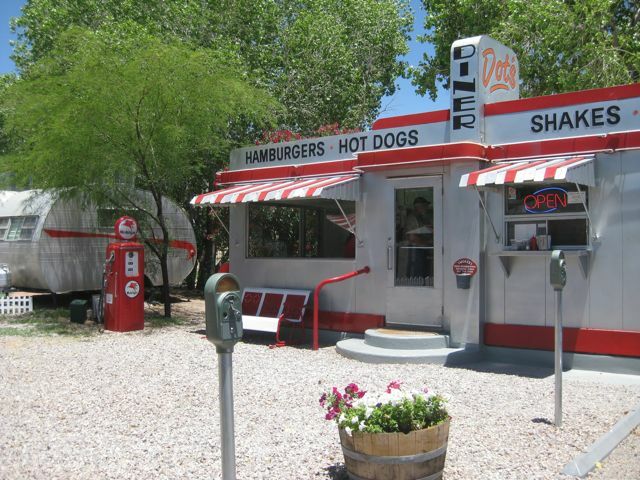 They make a great solar lunch. This is my basic method for most legumes, in this case lentils. I put the lentils, water and a bay leaf in one pot, and in the other olive oil, chopped onions, carrot, celery, and a can of diced tomatoes. Cover both and let simmer in the Sun Oven until the lentils are soft. Drain the lentils and combine everything in one pot, replace the cover, and continue to simmer. Now there is room to make some rice. When the rice is ready so is dinner.